So some of you may or may not remember when I spoke about my *cough* lady mustache *cough*. Back then, I was unsure of what to do and I got some great emails from some of you as well as other advice. I even went to eat sushi one day and my friend worked at the restaurant and said he could totally relate because his sister had a lady 'stache. It seemed that removing the 'stache was the way to go for most of my readers. 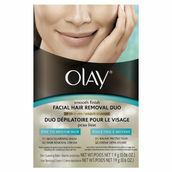 This is part of the reason I was really excited when I came across Olay's Facial Hair Duo removal kit in P&G's eStore...because while I am not at all ashamed to go to a store and buy the kit, I am a bit lazy--I mean a homebody-- so online shopping is for me. What also gets me going is the fact that they have free shipping for orders over $25 as well as 15% off your first order (use code A9Z-MN5-KY3-ISA). They also allowsme to throw in other products (or to take advantage of some of their cool bundles! ), save money, and shop from the convenience of my home. Oh yea, and get rid of mustache while not harming my skin--thanks to Olay of course! Plus, you get FREE samples with every order. Heck yes! What has prompted this sudden interest in getting rid of my lady facial hair, you might ask? Well, it goes without saying, but I am a "say it" kind of gal, and I feel obligated to mention that it IS the holidays. This means I am trying to look snazzy because I am hoping to snap a new family picture this Christmas. Snazzy will obviously look different to everyone. Some will want to whiten their teeth, others just slap on some moisturizer after getting rid of their facial hair, throw on a coat of mascara and they are ready to hit the buffet (holla!). No matter what your holiday beauty ritual, one thing we can all relate to in the holiday season is not having enough hours in the day to complete all the shopping, wrap the presents, stuff the stockings and beautifying ourselves. For this reason, hopping on the P&G eStore to stock up on your everyday items at great prices--stuff like lotion, razors and batteries (hello, have you EVER known a time when you don't need batteries?!?!) --seems like an extra awesome idea. ...Because I may not be able to be everywhere at once, but the Internet makes me FEEL like I can be. Heck, I can be shopping in multiple windows on my browser while cooking up a fresh batch of Christmas cookies! So if you want to save a little time and money on essentials, give the eStore from P&G a gander. Your lady mustache will thank you.